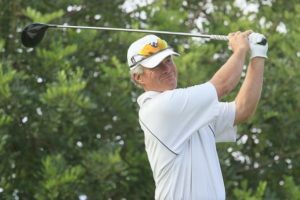 PGA player Jeb Stuart is a partner in Pure Swing Golf. Now is the time many area residents turn their attention to getting their golf game in order. A high-tech facility has just opened in Dallas where you actually learn using the newest equipment combined with one-on-one instruction from former pros. Founder and director of golf Anthony Broussard and former PGA player Jeb Stuart have opened Pure Swing Golf, a modern, 2,300 square foot golf training facility at 13617 Inwood Road. An instructor since 1986, Stuart won 20 tournaments at various levels and participated in two U.S. Open champions. Broussard won the 2014 Texas State Open, played in the 2014 U.S. Open championship at Pinehurst, N.C. and played on the Web.com tour. As part of a family tradition, Stuart went on to New Mexico Military Institute and began winning golf tournaments in his teens. He became the high school state champion in New Mexico, and later went to the University of Arizona and McNeese State. He played in mini tours, in Canada, on the European Tour and some events in South America. The facility has a large putting green. Players can take full swings into simulated holes. A locker room with showers is available. More information can be found at pureswinggolf.com. This latest technology, coupled with personal instruction, may get you back in the swing of things. Baseball lost a legend on Feb. 7 with the passing of Frank Robinson. Born in Beaumont and raised in Oakland, Calif., Robinson was the youngest of 10 children. He was a high school legend on the playing field. He quickly went up the ranks of the Cincinnati Reds organization and won the National League MVP with the Reds in 1961. In 1966, he was traded to the Baltimore Orioles where he won the American League Triple Crown in his first year there, hitting .316 with 49 home runs, 122 RBIs and 122 runs. He also won the AL MVP, making him the first player in baseball history to win the MVP in both leagues. On April 8, 1975, when he took the lineup card to home plate as player-manager of the Cleveland Indians in front of 56,715 at Cleveland Stadium he became, at that moment, the first African American manager in baseball history. In 21 seasons, Robinson hit 586 home runs, was a 14-time All-Star and was elected to the Baseball Hall of Fame with 89.2 percent of the vote in his first year of eligibility in 1982. “Frank Robinson’s resume in our game is without parallel, a trailblazer in every sense, whose impact spanned generations,” Commissioner Rob Manfred said. Robinson died after a prolonged illness. He was 83.